For over 25 years, Monroe County residents have enjoyed a progressive and convenient curbside recycling program. As is its charge from the county, Waste Management, Inc., the Monroe County Recycling Center’s (MCRC) contract operator, examines the waste stream for sustainable recovery opportunities. In 2014, the MCRC started to accept Mixed Recycling materials from its recycling collector customers. Mixed Recycling means that paper materials no longer need to be separated from containers--they can all be mixed together. NEW!Monroe County's Recyclopedia! Click here for in-depth answers to recycling questions! Gable Top (Milk and Juice) Cartons and Drink/Soup Boxes: remove and throw away plastic straws; reattach caps for recycling. Home Office Paper, Files, School Papers, etc. : shredded paper in brown paper bags only. All Envelopes: window envelopes too! Paper Boxes—cereal, cracker, soda, tissue, shoe, gift, toy, etc. : flatten box and recycle any plastic liners at grocery store with other plastic bags. Pizza Boxes & Paper Egg Cartons: discard all contents and flatten. Metal Food and Beverage Cans: lids are accepted. EMPTY Aerosol Cans: with caps. NO pesticides or spray paints. Glass Food and Beverage Bottles, Jugs and Jars: reattach and recycle lids and caps. No drinking glasses, window glass, pyrex, light bulbs, etc. *The ecopark will accept some of these items. Click here for more information. Download the Recycle Right flyer with a listing of acceptable materials for Mixed Recycling at the MCRC. Sign up for our electronic newsletters for answers to the most frequently asked recycling questions so you can be sure you’re recycling right. Request a free magnet and printed flyers with recycling related information. Q. Can I recycle all plastics marked #1-#7? A. No, the recycling symbol that includes a number, does NOT necessarily indicate recyclability. These resin identification codes were created by and for the plastics manufacturing industry, not to communicate to consumers whether an item can be recycled curbside. Recycle plastics by their shape: bottles, jugs, jars, and tubs. There are a number of items marked with a number that are not acceptable for curbside recycling including plastic bags, foam egg cartons, and small plastics like coffee pods and pill bottles. Q. Should I separate my recyclables using plastic bags? A. NO, keep recyclables loose and unbagged in container! Plastic bags, cords, ropes, etc. 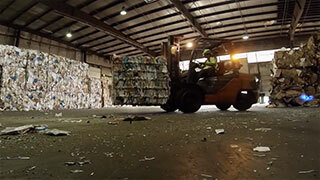 wrap around recycling machinery causing facility downtime and also contaminate recyclable paper. Plastic bags and product wrapping may be recycled at most large retail outlets. Q. What type of plastic bags/film can be recycled and where? A. Plastic bags and film should be brought to retailers for recycling. New York law requires major retailers that offer plastic bags to their customers for purchases take them back for recycling. Many other kinds of plastic bags/wrap are accepted in the same receptacle for plastic bag recycling at stores including bread bags, newspaper bags, produce bags, case wrap, cereal box liners and more. A recent county residential waste characterization study found that eight percent of household garbage was made up of plastic bags or wrap--much of which could be recycled. Please click here to learn about plastic bags/product wrap recycling and what can and cannot be recycled at the store. If you would like a one-page guide to plastic bag and product wrapping recycling, click here or here for frequently asked questions about recycling plastic bags and product wrap. The Monroe County ecopark also accepts certain clean, dry plastic bags and product wrapping. Q. Can I recycle caps and lids from containers? A. Yes, caps, lids, and spray pumps should be reattached prior to recycling container. 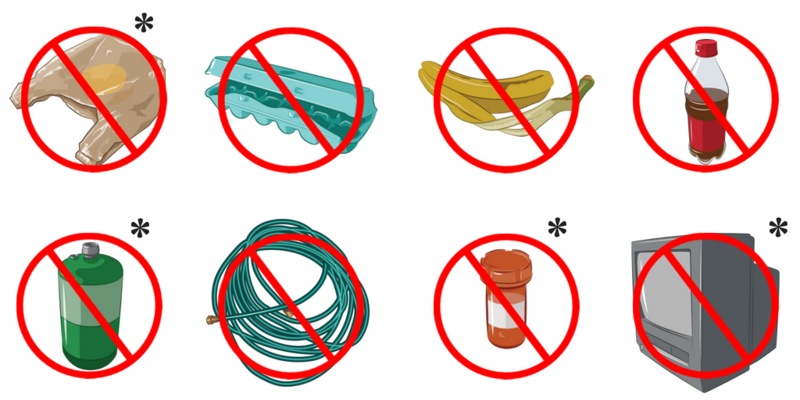 In the past these items were not accepted for curbside recycling, but with recent changes in the variety of plastic accepted as well as advances in the technology for sorting materials, caps and lids are now acceptable. Caps and lids should be reattached to the container to ensure they are recycled and do not end up as litter. Q. Can foam egg cartons, coffee cups, and packaging material with a #6 be recycled? A. No foam (commonly known by trade name Styrofoam™) cannot be placed in recycling bins regardless of number. Foam meat trays, egg cartons, coffee cups, takeout containers or other small post-consumer items have no local recycling option and should be placed in your trash. The ecopark will accept clean, white, block packing foam only. Q. Can pizza boxes be recycled? A. Yes, clean pizza boxes can be recycled. First, remove any wax paper lining and dispose in trash. If the bottom of the box is covered in grease and food residue, tear off and dispose of that portion in the trash and recycle the clean lid. Q. Can I place small electronics in my recycling bin or TVs at the curb? A. No, electronics are generally not accepted curbside for recycling or disposal. In fact, it is illegal to dispose of a number of electronics curbside (see DEC regulation.) The ecopark accepts all types of electronics for recycling. Large metal appliances (i.e. white goods) can often be recycled by calling your waste collection provider. Q. Can I shred personal information before recycling? A. Yes, shredded paper should be contained in a paper bag or box only (not in a plastic bag.) The ecopark offers household shredding service and also accepts shredded paper for recycling. Q. How do I recycle cardboard? A. Clean cardboard boxes should be flattened and put in or next to recycle bin. Large cardboard pieces should be reduced to 2 feet by 4 feet and bundles should NOT be tied with string or twine. Q. Why are the guidelines always changing? A. As markets develop for new types of packaging, Monroe County works with the operator of the Recycling Center to identify opportunities to recycle more. Guidelines may also change to encompass more acceptable recyclable materials due to advances in recycling sorting technology. Differences exist between municipalities and collection company guidelines due to access to markets, sorting technology, and composition of the waste stream. Q. Should I place my recyclables at the curb on very windy days or if a storm is forecast? A. Use your good judgement on whether to delay your recycling. Recyclables that blow around the neighborhood are litter. Avoid putting bins out the night before collection if a storm is forecast to reduce litter. Q. Where can I get a new/replacement recycling container? A. Contact your waste collection provider. Containers may be purchased at home improvement stores but always check with your recycling collector first to ensure program compatability. For answers to more Frequently Asked Recycling Questions, click here!